I’ve partnered with Veal Made Easy to bring you this recipe. Friends, you simply have to make these meatballs! Your taste buds will thank you over and over again. They may not state it verbally, but trust me, they’ll say it in a way that you’ll understand. 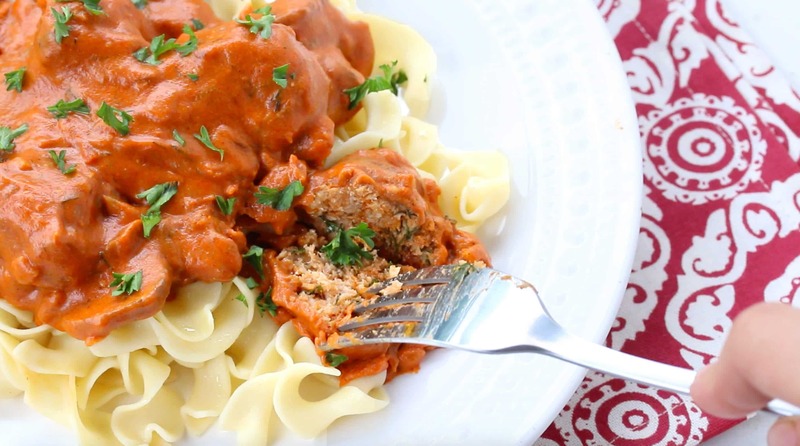 These luscious meatballs are inspired by the flavors of Hungarian cuisine, one of my favorites. They are easy to make and ready for the table in about 30 minutes. The rich flavors of this comfort dish are an absolute feast for the palate! The smooth and creamy sauce is vibrantly red from sweet paprika with the wonderfully deep flavor of caramelized onions and mushrooms (yes, you can omit them if you don’t like them) with the zesty touch of dill and freshened up with the tangy taste of sour cream. Simply put, they’re irresistible. Ready for a short drooling session? Watch my video as I prepare these meatballs! 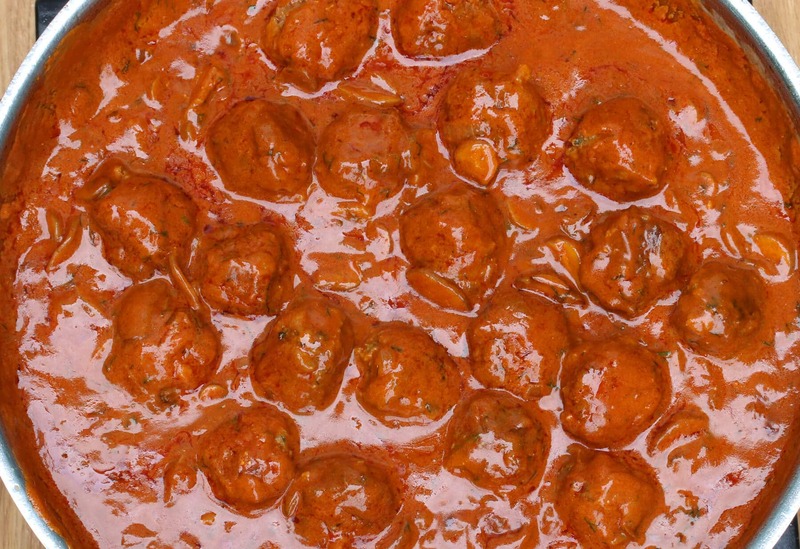 WARNING: Viewing this video may create an insatiable craving for Hungarian Meatballs. This dish also makes a nice time-saver: Make and freeze the meatballs in advance and then plop them in the simmering sauce at the appropriate stage. These meatballs are also great as leftovers: Simply thin the sauce out a bit with some broth, milk or cream if it’s become too thickened. The flavors will be even better once they’ve had time to meld. Before we get started, an important note about paprika. There are many options out there to purchase, a tiny fraction of which actually come from Hungary. We cannot emphasize enough what a massive difference quality Hungarian paprika makes. We recommend this genuine Hungarian paprika from the Kalocsa region of Hungary. 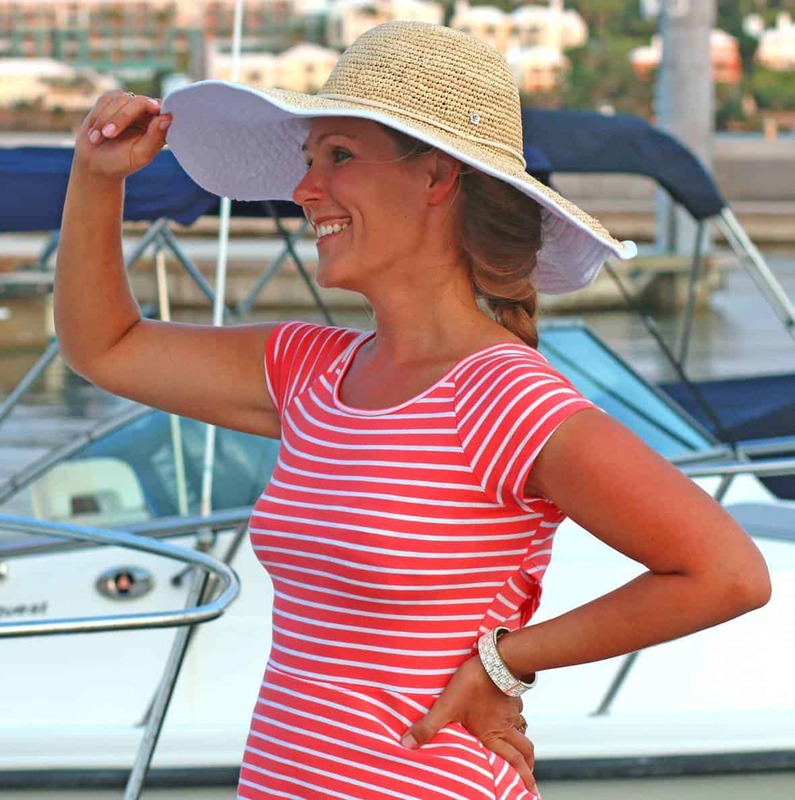 It has a wonderfully rich flavor and an exceptionally vibrant red color. Many of our readers have tried this paprika, written back and agree that quality Hungarian-imported paprika makes all the difference. For our meatballs we’re using veal, commonly enjoyed in Hungarian cuisine. Veal is prized among chefs worldwide for its versatility, delicate flavor and tender melt-in-you-mouth texture. It also has a lower fat and calorie profile than beef. For more information about how veal as well as a ton of recipe ideas, check out Veal Made Easy. You can find veal at any butcher shop and most grocery store meat departments carry ground veal as well. A note about veal: A lot of positive changes have been made in the U.S. veal industry in recent years. I purchase it from butchers who source their veal from producers who pasture-raise the calves with social interaction of other animals. You can use any meat of your choice for these meatballs but veal is very lean and delicate in flavor. Place all the meatball ingredients in a medium-sized bowl and knead to thoroughly combine. Shape the mixture into 1-inch balls or whatever size you prefer. 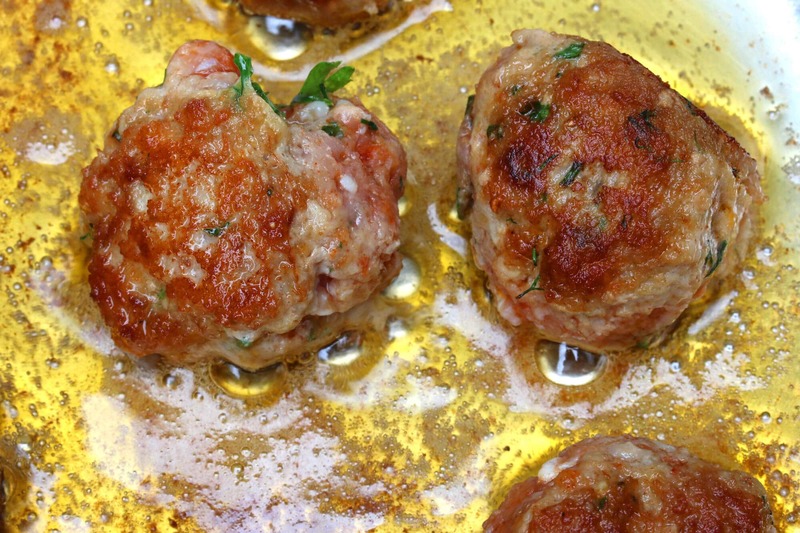 Heat some oil in a skillet and once hot add the meatballs, browning on all sides. 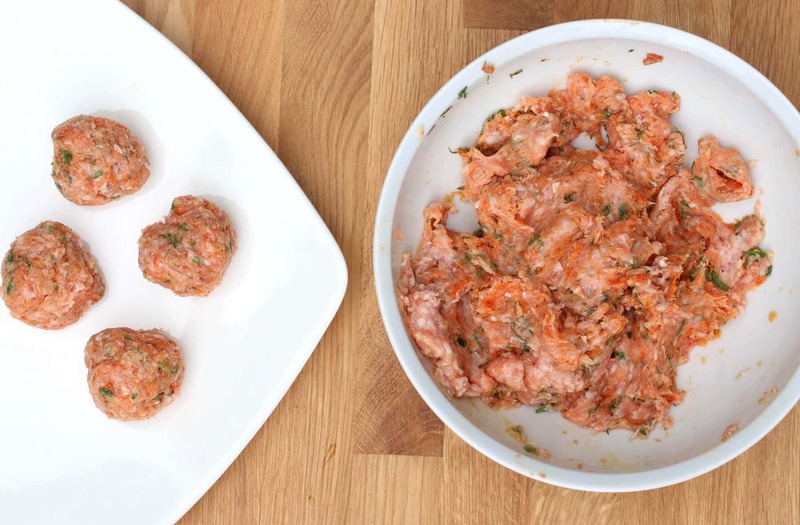 Transfer the meatballs to a plate and discard all but a tablespoon or so of grease. Add the onions to the skillet and fry until translucent and golden brown. Add the garlic and fry for another minute (don’t fry garlic too long or it becomes bitter). 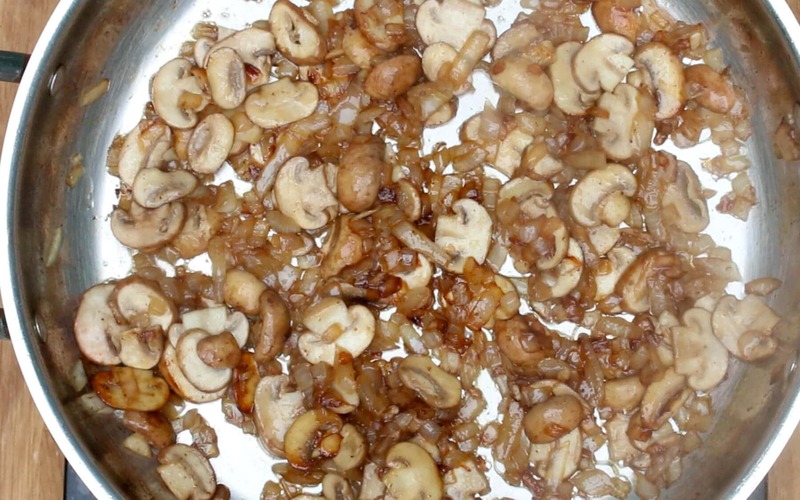 Add the mushrooms and fry until they’ve released their juices and they’re mostly evaporated. Transfer the mushroom mixture to a bowl and set aside. Add the butter to the skillet and melt it. Add the flour and whisk until dissolved. Continue whisking vigorously for another minute or two until the flour mixture is a deep golden brown. We’re creating what’s called a roux, a French term and the grand secret for creating an irresistibly rich and flavorful sauce. Pour in the hot broth while continually whisking to prevent clumping. 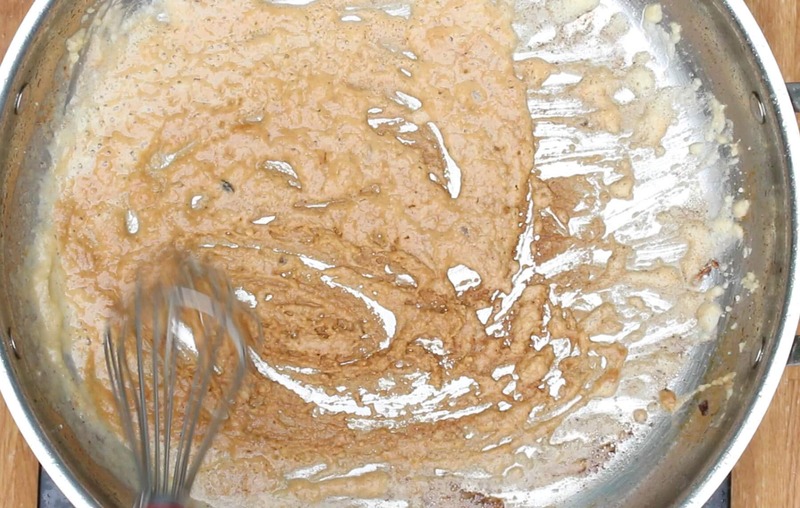 Continue to whisk while bringing the mixture to a simmer. Add the cream and whisk until combined. Continue to simmer for another minute or so until the sauce is thickened. Return the mushroom mixture to the sauce and add the pepper, salt and paprika. 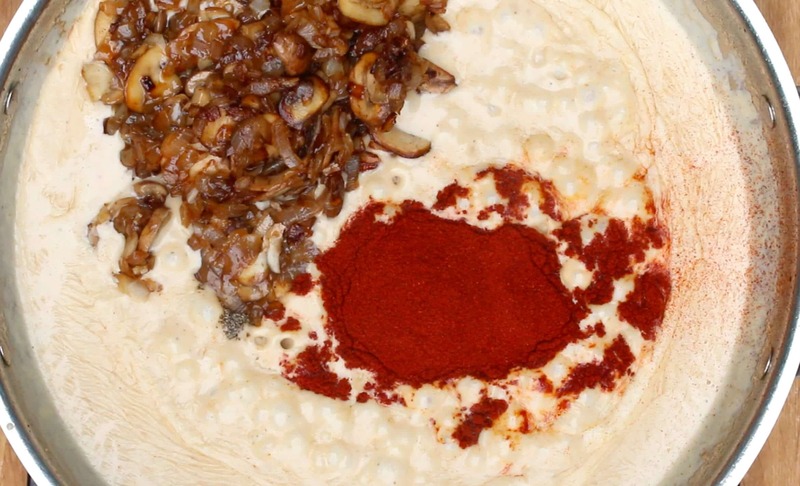 As you stir get ready to admire the beautiful velvety red sauce that’s created! Stir in the sour cream and dill. Gorgeous! Return the meatballs to the sauce, stirring to coat them, and simmer covered for about 10 minutes, stirring occasionally. Serve immediately over hot buttered egg noodles, Spätzle or rice along with a cool cucumber or leafy green salad and some rustic crusty bread. Garnish with some chopped fresh dill if desired. Serve over hot buttered pasta, homemade Spätzle, potatoes or rice along with a cool cucumber or leafy green salad and some rustic crusty bread. Place all the meatball ingredients in a medium-sized bowl and knead to thoroughly combine. Shape the mixture into 1-inch balls or whatever size you prefer. 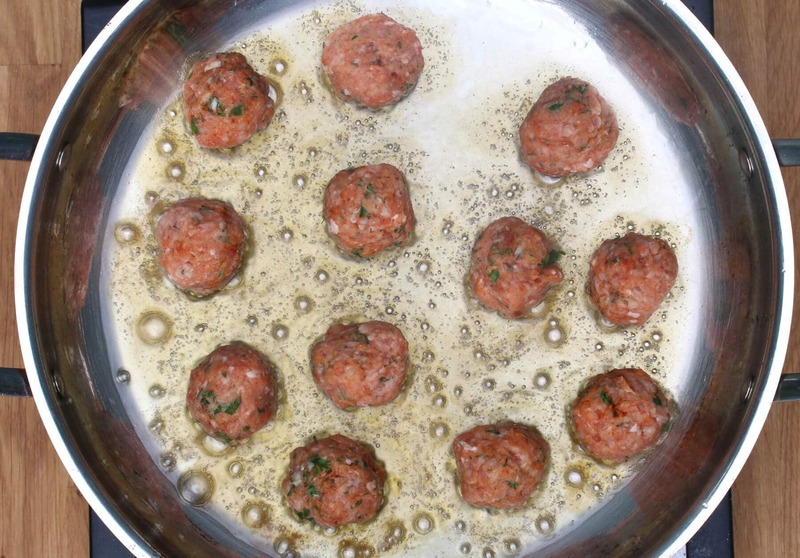 Heat some oil in a skillet and once hot add the meatballs, browning on all sides. Transfer the meatballs to a plate and discard all but a tablespoon or so of grease. Add the onions to the skillet and fry until translucent and golden brown. Add the garlic and fry for another minute (don't fry garlic too long or it becomes bitter). Add the mushrooms and fry until they've released their juices and they're mostly evaporated. 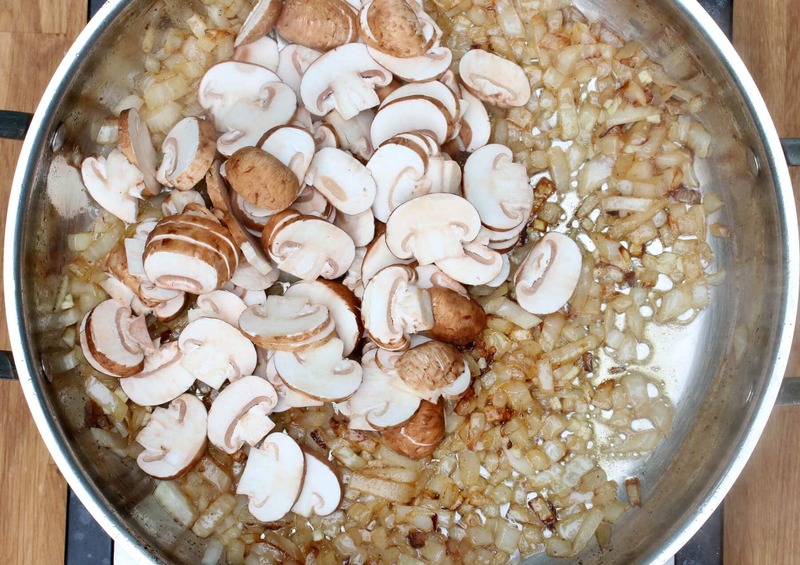 Transfer the mushroom mixture to a bowl and set aside. 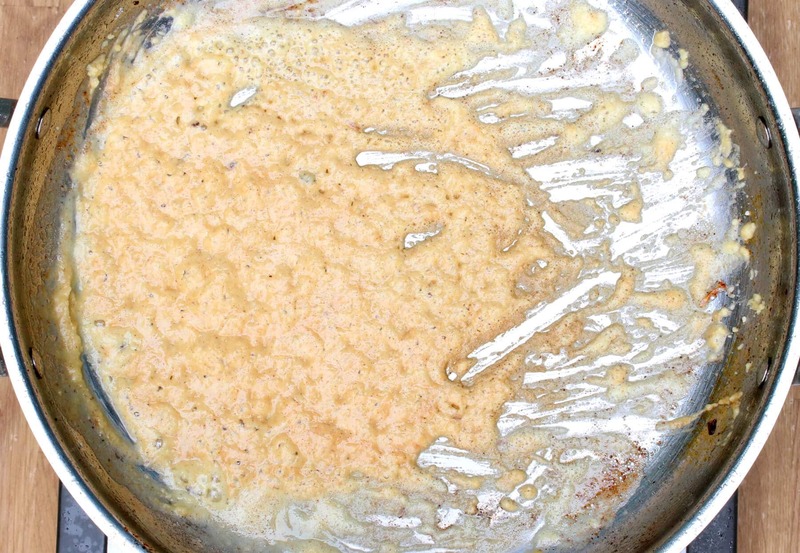 Pour in the hot broth while continually whisking to prevent clumping. 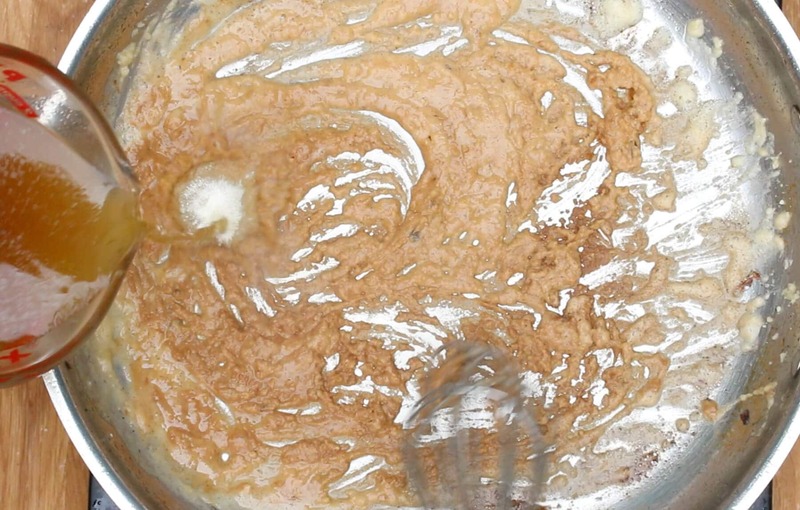 Continue to whisk while bringing the mixture to a simmer. 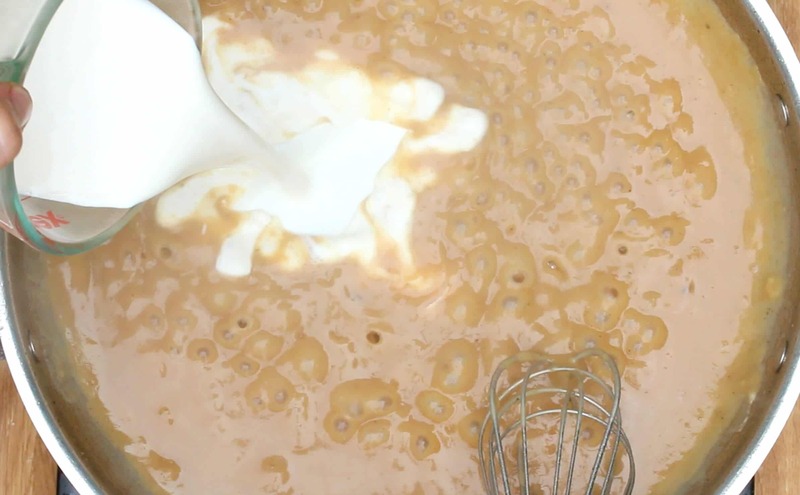 Add the cream and whisk until combined. Continue to simmer for another minute or so until the sauce is thickened. Return the mushroom mixture to the sauce and add the pepper, salt and paprika. Stir in the sour cream and dill. Serve immediately over hot buttered egg noodles, Spätzle, potatoes or rice along with a cool cucumber or leafy green salad and some rustic crusty bread. Garnish with some chopped fresh dill if desired. I’ve partnered with Veal Made Easy to bring you this recipe. Thank you to my readers for supporting the brands that help make The Daring Gourmet possible. I would make these but omit the Veal. Calves raised for Veal are subjected to brutal living conditions during their short but miserable lives. Anyone who eats Veal should be forced to witness these conditions. There may well be a movement towards more humane Veal production but I am basing my comment on my personal observations. I was raised on a farm and several friends of mine used to raise veal and I saw first hand how they were raised. From what I see, these same methods are currently being used to produce Veal in our area. Sitting around all relaxed while getting massages. Being completely taken care of and given food. Oh what inhumane torture. What a terrible life. I know I’d hate lounging around in a spa all day. I’m just glad it creates such tasty meat product. I’m making a vegan version of this for a christmas dinner this weekend to cater to some non-meat eaters in our family. I’ll see how it turns out and report back. Hi Vick, I haven’t tried freezing it so I’m not sure how it would impact the texture of the sauce, but it will probably be fine. You would simply freeze the meatballs and sauce together in a ziplock bag or airtight container, thaw and then reheat. 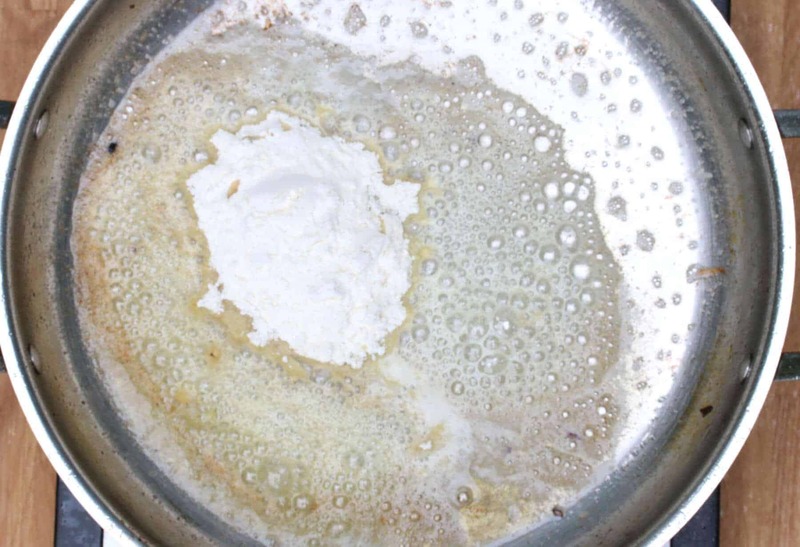 You may need to add a little extra cream or broth to thin the sauce if it has become too thick. SHAME on you for promoting the eating of veal. Anyone who has ever looked into how it is made would never eat it again. Newborn baby calves are raised in tiny cages so small they can’t even stand up and basically tortured for their entire (VERY short) lives, to bring you this EVIL meat product. No, I am not a vegetarian. I eat meat from animals that are reasonably humanely raised and slaughtered. But certain meats — particularly VEAL and FOIE GRAS (look it up) are only produced through the prolonged torture and suffering of innocent animals. I learned about the production of veal in my early 20s and haven’t eaten wienerschnitzel — or any other veal dish (formerly one of my favorites) — in more than 40 years. People, have compassion on the animals that feed you. Don’t make them suffer horrible and needless torture just for a little more flavor to tempt your tastebuds. I’m just glad it creates such tasty meat product. My favorite meat product I must say. Veal is definitely something everyone should enjoy. Yum. I haven’t seen any of these “Spas” around here. Calves in the local veal barns are still kept in miserable, crowded conditions and definitely get no massages. I took a look at the website – I saw that they’re still confined to stalls – I agree that this is an improvement over what the conditions used to be but until they’re veal merely based on age and diet rather than confinement of any sort…I’m still just not interested. I understand that male calves have a limited usefulness, but I wish they had done away with the confinement entirely…THEN and only then would I consider veal. I do appreciate knowing though that they’re going in a better direction with their husbandry practices. Let’s hope they continue in this direction until they allow freedom from confinement. Veal is tasty meat. I too use it whenever I can. I love veal! It adds a unique richness and flavor to my bolognese sauce, and to my meatballs and meatloaf. And there is nothing better, then a true veal stock for sauces and cooking! Mmmmmm. My kids love meatballs and are always asking for them. I’ll have to try these! 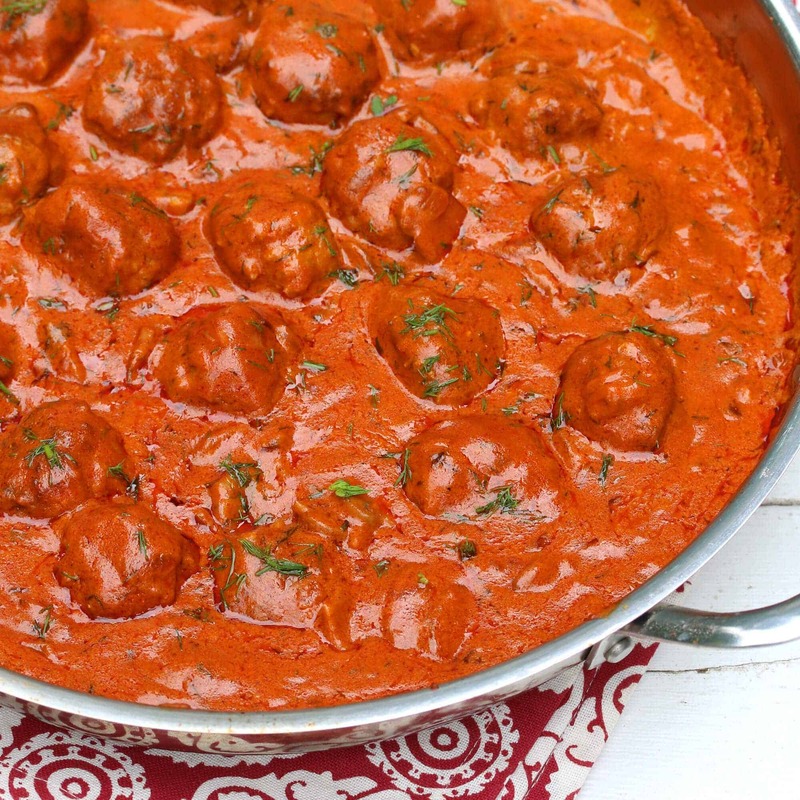 These meatballs look absolutely INCREDIBLE! I haven’t even had breakfast yet and I’m already craving them! :) Can’t wait to try them! Holy wow! These look sooooooo good!!! I adore Hungarian food and my mom makes the best Hungarian spätzle (nokedli)…that sauce looks divine!!! I love veal and meatballs so this is two of my favorites here! I actually just visited a farm last week and they treat their calves SO well and love them. Holy smokes! This looks amazing! I need to make this for dinner this week! OMG. Cannot. Stop. Drooling. 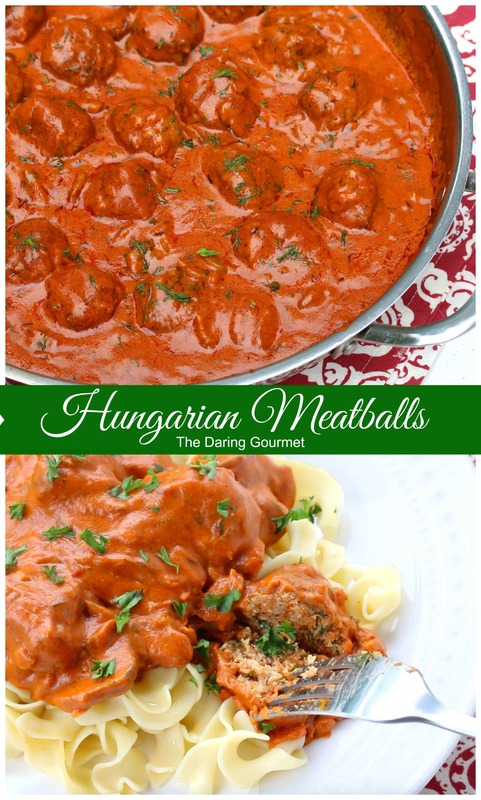 I’ve never tried these, but after this post Hungarian meatballs are going to the top of my to-do list! Love! My kids love meatballs! I love that you added mushrooms! OMG, these look absolutely amazing! Through your whole video the buildup and anticipation of the final outcome had me at the edge of my seat and then at the very end I just wanted to dive in and devour my screen, lol! :) I’m going to make these SOON! I am a novice with no idea what SWEET Paprika is. And advice on brands available by mail order, or in local grocers in So. Central Texas (i.e. HEB) would be gratefully accepted! Thank you so much! I really enjoyed the explanation… I had no idea there were different types. I went straight to the link but, of course, the item was “Currently Unavailable”, lol. I signed up for the alert when it was back in stock, eventually I am going to make and enjoy this dish! I make this recipe with a beef/pork mixture and use some hot paprika along with the sweet. That’s the way my grandmother made it. Delicious served over galuska. That sounds great, Mike, I’ve also made them with ground chicken and turkey and they’re delicious no matter what! Oh my goodness, these look amazing – that sauce sounds perfect and I’m so in love with meatballs in any form. 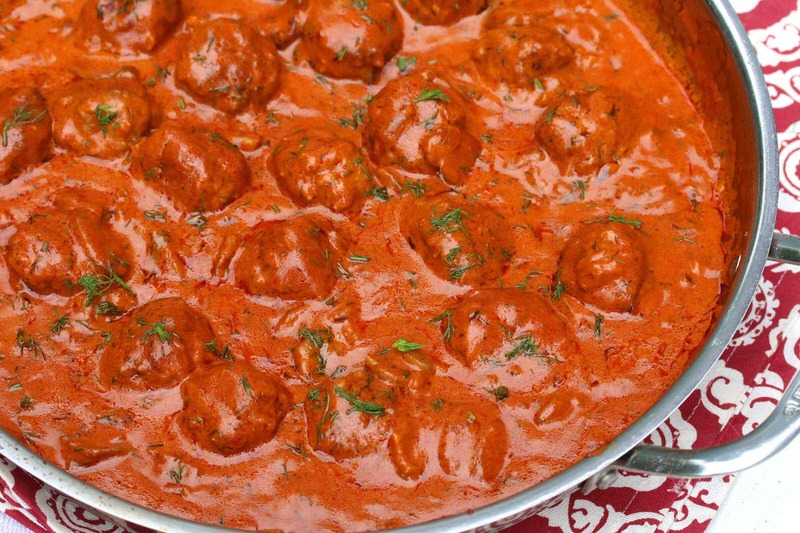 These meatballs do look delicious and I love all the step-by-step instructions, too! 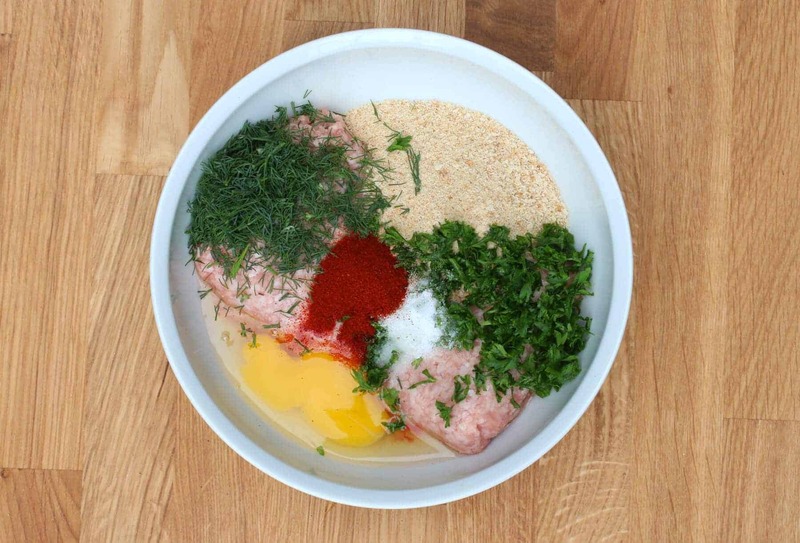 I’ve had Swedish Meatballs, but never Hungarian ones…I need to try this! I am not familiar with hungarian cuisine but these flavors sound great! I always add a bit of veal into my meatballs too. Using veal instead of beef it is a great idea. Those meatballs must be very tender and juicy. What a great dish! Thanks, Warren! And isn’t that the sad truth? You don’t have to look any further than chicken production (the most commonly consumed meat in the U.S.) to witness inhumane practices – they really don’t get any worse than that. I’m just glad anytime I hear about farmers who are moving away from poor practices and implementing positive changes. That sauce with all that Hungarian paprika is making my mouth water. I don’t cook veal too very often, but for this recipe I think I’d use it. I am seriously craving meatballs after seeing this post! Meatball is one most repeatable menu on our dinner table. I believe this scrumptious hungarian meatball will be our new list. I love meatballs! Love that I could make and freeze them for later! What a gorgeous dish! Beautiful colors and it sounds delicious! These meatballs and their wonderful sauce are absolutely delicious. I used ground beef since that was what I had on hand. Thank you so much for this recipe and also the many others on your site that I can’t wait to try. Truly excellent!!! That video totally did make me crave these meatballs! They look so good! I’m freezing right now and just looking at these photos makes me want to get into the kitchen and start cooking this asap! All of my Hungarian relatives are going to go nuts for this recipe! This looks and sounds absolutely delicious and that sauce, heavenly! I love meatballs and these look delicious. I don’t care for veal but I do plan on making some adjustments and making this recipe! It’s gorgeous! I would give these more than 5 stars if I could, they were DELICIOUS! Even our three fussy eaters ate everything on their plates. Big family hit. Thank you! I’m so thrilled to hear that, Cori, thank you! I made this recipe for a school meatball party. It was amazing!!! I substituted the veal with a pork and beef mixture. Awesome, Steph, I’m so glad they were a hit, thank you! Am serving these meatballs again this weekend, since I had so many leftover meatballs. A local, upscale grocery sells a “meatloaf” mix that is one third each of veal, ground round and ground pork, but that means almost 2 lbs of meat, so I had plenty of leftover meatballs to freeze. I omitted the egg, since I never have eggs around, and just added extra breadcrumbs moistened with milk. Best meatballs I’ve ever cooked. The sauce was out of this world, but I’m going to cut back the cream to half a cup, since the color of the sauce was more salmon than paprika orange. I would suggest planning 5 meatballs per person, assuming a 1 1/4″ diameter meatball. Real winter comfort food. Thanks, Kimberly. That’s terrific, grayslady, I’m so glad you enjoyed them as much as we do – thank you! Wow! I came here because a friend from Hungary brought me some paprikas and goulash cream, so I was looking for authentic recipes. May I say you have a very beautiful and exciting website. I like to cook and love Greek food as well as all kinds of cuisines.Your recipes look so delicious, and authentic.I have not made the recipes yet, but I cannot wait to try them. I am sure I will be back and I will let you know how things turn out! 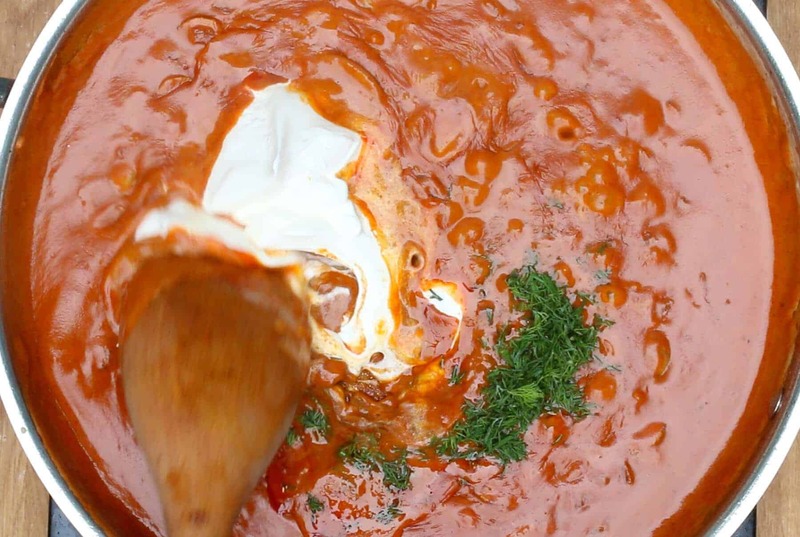 Thanks for the beautiful pictures of Budapest included with the Goulash recipe. I want to make my Goulash homemade, but can you tell me anything about Gulyaskrem (goulash cream) and how to use it? Hi Chris, I’m so glad you found us and thank you for the compliment! I hope you enjoy everything you try. Gulyáskrém is a paste made from hot paprika, tomatoes, onions and spices and is often used to flavor sauces and soups as well as added to goulash as a short cut for creating flavor. You won’t need it when making an authentic Hungarian goulash from scratch as it has plenty of flavor, but if you can use it to add an element of heat (or just add plain some plain hot powdered paprika). But if you have only have a limited amount of gulyáskrém I’d save it for some other sauces and gravies that don’t benefit from the full depth of flavor that a simmered stew like goulash does. Happy cooking and I’d love to hear what you think once you’ve had the opportunity to try some recipes! Many thanks Kimberley, my chef made this recipe with Kangaroo, as we live in Australia, with one must say, rather superb results. Kangaroo has quite a game caught type of flavour, not particular to most, however most suitable to a sauce such as your own, congrat’s mate. Making these for a work potluck today. Hoping it will hold up in the crock pot! Wish me luck! Awesome, Kristen! If you’re just keeping them in the crock pot to keep warm that should work great. Let us know how they go over with the crowd! I realized I never reported back to you on these. Well, I’ve made them 3 TIMES already (twice with veal) and LOVE them! :) They’ve become a regular on our dinner table, everyone loves them including our youngest (aka “the picky one”). Thanks for such a great recipe! This meal is divine. I made it with twice the veal and my mouth has been thanking me since. Thank you so very much. Thank you, Gadge, I’m so glad you enjoyed it as much as we do! I think I will try this tonight. I made your “Weeknight Jambalaya” last night and it was quite tasty. Terrific, Benny, let us know what you think about the meatballs! Taste turned out great! Sadly, I couldn’t achieve the brilliant brilliant bright red color. It is a little murky reddish-brown. Fantastic, Benny, I’m glad you enjoyed it! The addition of the sour cream brightens up the color however the color will vary depending on the particular brand as well as the freshness of the paprika. Taste and color will be better with real, Hungarian Paprika. I also use more Paprika than a recipe calls for, especially when making Chicken Paprikash with Galuska. What meat can I use instead of veal? Hi Ivory, any meat you like! This works great with beef, chicken, pork, lamb, turkey or wild game. Absolutely delicious. Took much longer than stated to prepare but it was worth it! I used 50% less fat creme fraiche. 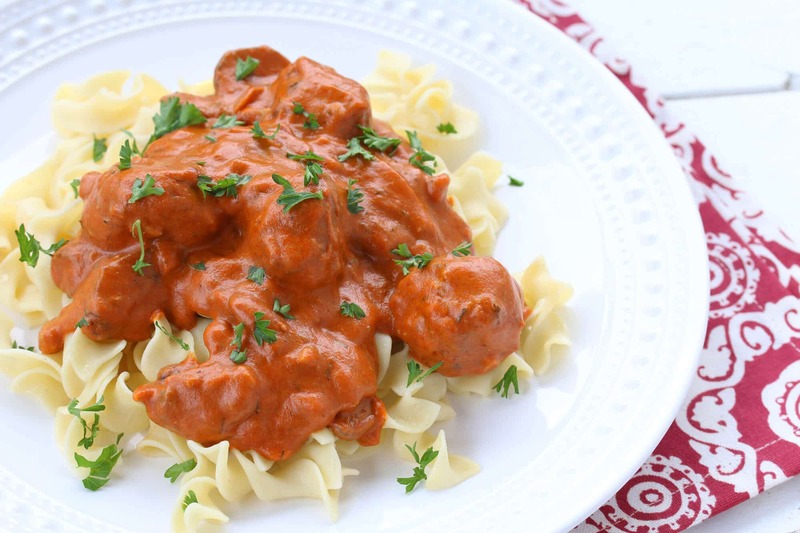 A very tasty dish, sort of a take on the Hungarian Chicken Paprikash. I have made this dish exactly as the posted recipe directs and also with substituting pork for the veal and chicken broth for the beef. For those concerned about the veal controversy (and yes, I know this recipe was sponsored or is affiliated to a veal producer), I suggest using ground pork. First off, I enjoy a good veal chop, osso bucco and veal breast. And a good Weiner schnitzel. Good stuff all. But high grade, milk fed veal in the USA is tough to come by. Veal that I see in the grocery stores (USA) are typically older animals with pink to darker pink meat rather than the very delicately flavored milk fed white veal. In a dish such as this one, that includes a savory sauce, I find it perfectly fine to substitute ground pork. Frankly, I doubt anyone could notice any taste difference between veal and pork in this dish, due to the meat being ground and being served in the savory sauce. And ground pork will come in at less than half the price of veal. So, if you are uncomfortable using veal or want to make this recipe more budget friendly: Oink! Oink! I’d also sub chicken broth for the beef broth. I’m glad you enjoyed it, Jim, thank you! And yes, I frequently use pork for this recipe as well. Just found your site and anticipate many more amazing entree’s!!! Have you tried it with ground beef? Hi Jill, you bet, ground beef’s a great choice. Made these today. They were lovely. I used steak mince, I may try pork or a mix next time. Such depth of flavours! My husband was adopted by Hungarian parents so I love to spoil him a bit with familiar flavours. Wonderful, Angela, I’m so glad you both enjoyed them, thank you!